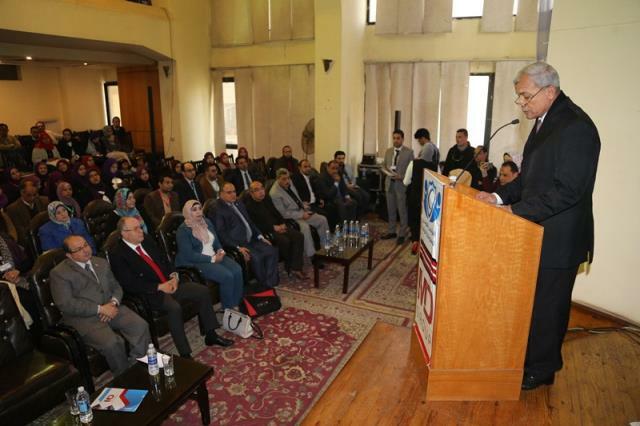 Menoufia Governor Witnesses the activities of the First National Conference of Pharmaceutical Informatics at the Pharmacists Syndicate in Shebin El Koum. Mr.officer Said Abbas, Monofia Governo stressed that the centers of pharmaceutical informatics are a fundamental pillar in building a health system based on scientific research and modern data. Mr.officer Saeed Abbas, Menoufia officer, witnessed the activities of the First National Conference on Pharmaceutical Informatics under the title "From Knowledge to Implementation" at the Syndicate of Pharmacists in the Medical union Professions in Shebin El Koum. In the presence of Dr. Hind El-Husseini, Head of the Egyptian Drug Information Center, Dr. Nassif El-Hefnawi, Undersecretary of the Ministry of Health in Menoufia, Dr. Mostafa Salam, Captain of Pharmacists. Menoufia, Western Pharmacists, Kaliobia, Dean of the Faculty of Pharmacy and a number of executive leaders. Dr. Mostafa Salem, Chairman of Monoufia Pharmacists said that the conference aims at community participation in the development of pharmaceutical information centers, building an integrated medical system, preparing pharmaceutical information cadres, spreading the experience in all health sectors, maximizing the social role and providing specialized centers in major institutions to provide pharmaceutical consultations to exchange experiences and develop the system. In the field of pharmaceutical informatics and the development of the pharmaceutical and health system in the field of global competition. Dr. Nassif Al-Hafnawi, Undersecretary of the Ministry of Health in Menoufia stressed that this conference comes to highlight the role of the Egyptian and Egyptian pharmacists as the first national conference on the level of the Republic to promote medical and health services and improve the system as a whole and to disseminate the experience in all health sectors. The first medical information center was established at the University of Kentucky in the United States of America in 1962 and in 1968 the first drug information center was established in Australia and the United Kingdom at Malbourn and Victoria Hospital. In 1969 a medical information center was established in London Hospital. The establishment of the first information center in the Faculty of Christian Medicine in India in cooperation with the United Kingdom.